Our guide will greet you outside the customs of the airport after you retrieve your luggage and clear the customs, and then transfer you to the Hotel. The remaining time of the day is free for your individual activities. You must be ready to start your 12 days guided tour of China after having a tasty breakfast. 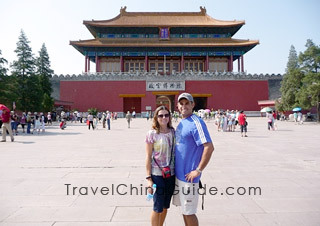 Our guide will pick you up at the hotel in the morning and drive you to Tiananmen Square in a few minutes. Your private capital excursion will start from the largest city square in the world, which is also the heart of Beijing. The guide will accompany you to have a short walk in the square and then proceed to the well-known Forbidden City, the largest and best-preserved royal palace complex in the world. The guide will give you a vivid introduction on the Forbidden City, including its long history, thousands of typical Chinese ancient buildings and the priceless royal collections. To ensure that you can taste the authentic Chinese food, we will serve you an a la carte lunch (valued at CNY150.00 per person and included in our price) at a famous local restaurant. That is quite a different experience than having lunch at the cheap tourist eateries as the most are doing now. It will help you to be energetic again for the easy walking around the existing largest and luxurious royal park of the country, Summer Palace this afternoon. Have been attracted by these splendid Chinese buildings? Today you will experience an excursion to the astonishing Mutianyu Great Wall in suburban area, including the round trip cable car ride. 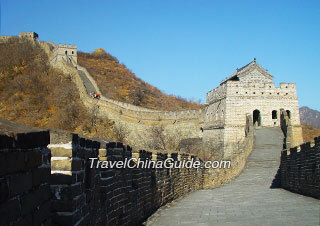 Mutianyu is a well-preserved section of Great Wall constructed 650 years ago. While transfer back to the downtown, you will see a profile of the huge Bird's Nest where the 2008 Olympics was held. This afternoon we will guide you to visit the Temple of Heaven. The Temple of Heaven is the holy royal temple in ancient time, where the emperors offered sacrifices to the heaven and prayed for good harvest. Flying to Lhasa where the altitude is 3,650 meters above sea level in the morning. 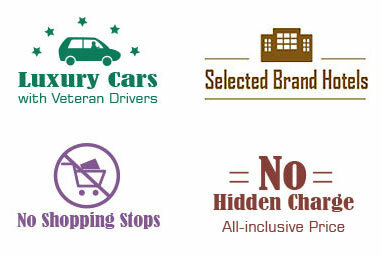 Our guide will pick you up from the airport and then transfer you to the hotel. In Lhasa, we have arranged the most comfortable 4-star hotel. It is suggested that you have a good rest at the hotel to acclimatize yourself to the high altitude of the city. This morning your private guided tour starts from Tibet Museum. We will serve a well-cooked lunch in a famous local restaurant. In the afternoon, you will go to the Sera Monastery which is one of the famous monasteries of the city and then the Norbulingka Park which was the summer palace for successive Lamas and now a public park. Today's highlight is to visit the Potala Palace. It is a shinning pearl of Tibet Plateau, located 3,767 meters above the sea level. 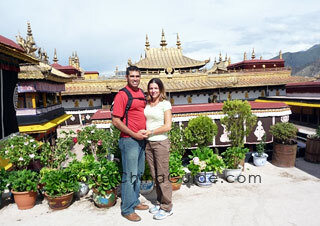 After lunch, the guide will take you to the Jokhang Temple. This temple is the spiritual center of Tibetans because the rare statue of the 8-year Sakyamuni is worshiped in the temple. Around the Jokhang Temple, there is the ancient Barkhor Street, where you will find characteristic shops one by one. The last stop of the day is a Nunnery. You could roam around the nunnery and watch the nuns chanting and rolling scriptures to put into prayer wheels. The morning is free for you to have a rest at the hotel. 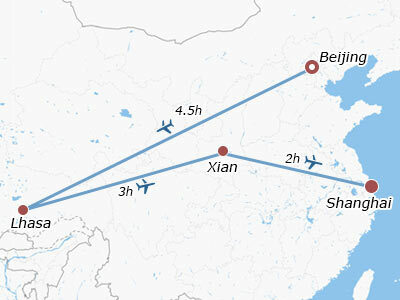 Around noon, you will take a flight to Xian, where our local guide is waiting for you at the airport and will transfer you the downtown hotel. 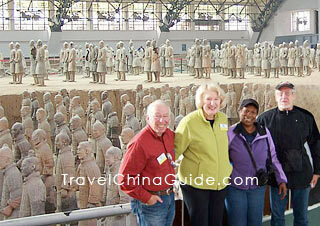 It will be a breathtaking trip today because you will see the grand Terracotta Warriors and Horses at close quarters. The guide will leave you enough time to enjoy the various kinds of lively terracotta warriors and horses created 2,200 years ago. Lunch is not included. The first stop of this afternoon is the well-known Big Wild Goose Pagoda, which was built in the Tang Dynasty (618-907) to collect the valuable Buddhist sutras taken from India by the hierarch Xuanzang. Later, our guide will take you to the nearby Provincial History Museum, which exhibits over 370,000 pieces of valuable cultural relics. This morning, you will go to visit Xian City Wall, which was constructed 600 years ago and is the best-preserved existing city wall in China. You could walk on the wall and observe this ancient city. Then, we will arrange a local family visit for you to communicate with the locals and learn how to cook Chinese dishes from our Chinese food cooking class menu. The host will invite you for an a la carte lunch (valued at CNY120.00 per person and included in our price) at home. In the afternoon, there is a visit to the Great Mosque, one of the largest and oldest Islamic mosques in our country. On the way to the mosque, we will drive by the Bell Tower and the Drum Tower, the landmarks of this city. You will take a morning flight to Shanghai and our guide and driver transfer you to the hotel in Shanghai. The rest of the day is free for you to explore this city by yourself. You could enjoy the trip leisurely today. In the morning, our guide will show you these historical collections in Shanghai Museum and then go to visit the quiet Yuyuan Garden. It is a good opportunity for you to see the enjoyable life of the rich man in ancient China. At noon, we will invite you to a farewell a la carte lunch (valued at CNY150.00 per person and included in our price) at a fancy and famous local restaurant, which offers authentic Shanghai and Cantonese cuisine. After lunch, you will take a short cruise on Huangpu River to view this city from different angles. The cruise will pass by the city's landmark - the Oriental Pearl TV Tower. 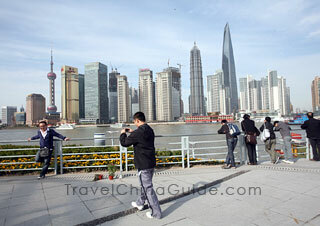 You will debark on the Bund, where you will have some free time to walk around. It will be interesting to explore some exotic buildings along the Bund area. Then visit an old street in Shanghai. Our guide will transfer you to the airport to take the homeward flight. Wish you a nice trip back home with beautiful memories of your 12 days China tour package! Thank you very much for putting up an excellent itinerary for us, it was carried out far more exceeding our expectations. Our guide Carol was the best of our entire tour, she was very friendly and outgoing. The location of the hotel was very good! The day we ate the dumpling dinner - Breakfast & the dinner would be enough food. Lunch was not necessary, but was very good! Our guide was very knowledgeable. I think it is essential in Tibet to offer a Tibetan guide as they best know the culture and customs. I would have liked to see more in Tibet such as the Everest Base Camp of Mt. Everest, but we did not have time, maybe on our next visit! Can I get permission to enter Tibet through you and go to Tibet Without the tourist program only the paper allow entry. Sorry, according to the policy, foreign clients are not allowed to visit Tibet on their own. They must take guided tours during the stay there. Thank you. Are singaporeans frm Spore allowed to bring processed meat like sliced roasted pork to Beijing ? As far as I know, passengers entering China are not allowed to bring raw or processed meat products on the international flight. Will there be lots of people in the Memorial Hall of Mao Zedong? I want to visit the Memorial Hall of Mao Zedong. Will there be lots of people? Yes, there are always lots of people waiting in line in the Memorial Hall of Mao Zedong, and the average waiting time is 3 hours. Visitors will have only about 10-20 seconds to see the chairman and crystal sarcophagus. I'm from Australia, and my husband is Chinese. Can we travel to Tibet? Yes, you can travel to Tibet. However,according to the policy, foreigners are not permitted to visit Tibet independently, so you need to join in a group through a travel agency if you hold Russian passport. Besides, you need to apply for Tibet Travel Permit. Anyone who can tell me the best way and estimated cost to get from Hangzhou Airport to Sofitel Hangzhou Westlake for example taxi, metro, etc. Thanks!!! For your reference, the best way to get to Sofitel Hangzhou Westlake from Hangzhou Xiaoshan International Airport is to take the Airport Line (Binjiang Line) at the airport and get off at Jiangling Road Station. Then you can walk to the subway station where you will get on Subway Line 1 and get down at Ding'an Road Station. After getting out of Exit C, you can walk to the hotel. The fare for the airport line and subway will be around CNY 23 per person, and it will cost around 1.5 hours on the way. In addition, you can also hail a taxi from the airport. The taxi charge will be around CNY 100, and it will take around 40 minutes on the way.